Liam, a fourth grader at Milltown School in Bridgewater, has been mind-crafting a video game as part of a class combining media and technology specials. Using Black Rocket Gaming’s Platformer program, Liam’s game challenges to collect players and build an NFL team. Level 1 requires finding New York Giants. Points are awarded for each player collected. The top level features building Liam’s favorite team, the Seattle Seahawks. Liam and Tyler are part of hundreds, even thousands of students throughout New Jersey realizing the virtues of game-based learning. The convergence of technology, engaging even the students in the “back row,” facilitating the needs of differentiated learning styles, building 21st-century classroom skill sets, meeting the “Next Generation Science Standards,” promoting oh-so needed confidence in this assessment-consumed era and inspiring kids to learn in their own element has led game-based learning and game-based teaching in the form of video game design to become one of the most powerful tools teachers can use in the 21st-century classroom. 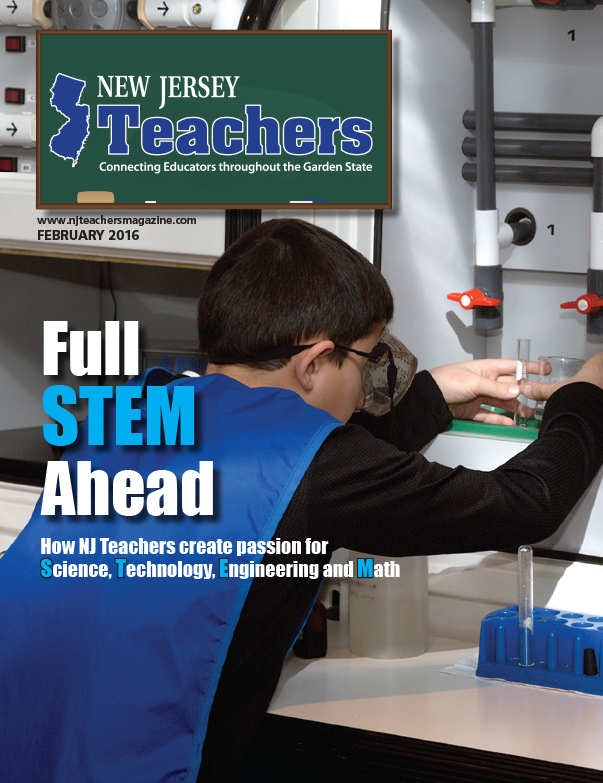 At the 2015 NJEA Conference in Atlantic City, the High Tech Hall featured two full days of presentations chronicling using video game design to impact ELA standards, science standards, student engagement, instructional design and SGOs. Later this month, Baumert will be presenting at the Florida Education Technology Conference, the second-largest expo of its kind, where the entire first day will be devoted to gaming in the classroom. The opportunity is for teachers to engage students on their turf, in their element. Gamers make up more than 90 percent of the student population, more than jocks, mathletes and perhaps all other student groups combined. When Ginn started with Black Rocket eight years ago, he was inspired by the level of engagement from kids in enrichment programs, the after-school and summer courses and activities. What if there was some way to create the same spark in the core content classroom? How many teachers could benefit from a mechanism to spark the kids, not necessarily the ones in the front row paying attention, “but the ones in the back row half-asleep?” Ginn asked. Game-based learning seems to be a natural conduit for engagement in the classroom. In the digital age, when kids spend so much time powering up on devices, why ask them to power down when they come into the classroom? Consequently, “gamification” – which the Oxford Dictionary defines as, “adding game-like principles to encourage participation” – fills classrooms with an Angry Birds or Madden or Fallout or Minecraft type mojo. Certainly gamification is not a new teaching concept. Bill Zengel, an award-winning writer and producer who had won MTV’s Music Video of the Year honors, founded Black Rocket in 2001 with his daughter Sarah. Their journey to help students become 21st century learners, thinkers and doers began shortly thereafter. When Ginn came on board full-time in 2007, he initiated professional development for teachers to bring game-based learning’s 21st-century ideas to teaching math, science, language arts and social studies. Black Rocket now offers a rapidly growing STEM curriculum targeted at Common Core standards that Baumert is helping to develop with teachers. 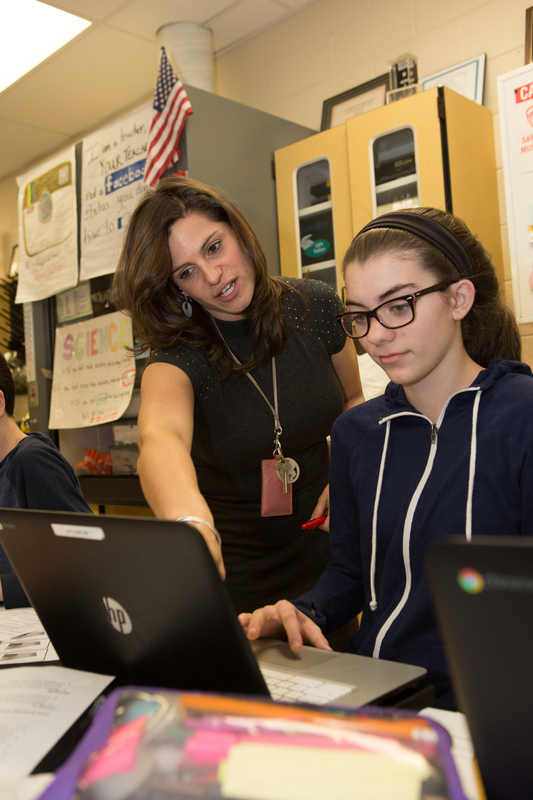 Ginn recounts how JoAnn DeVito, a teacher at Matawan-Aberdeen Middle School, was a year or two away from retirement when she first witnessed the power of game-based learning. He saw that as inspiration to get more than the one-percenters – the educators who are not afraid to try new things – into gaming. Score a point for video game-based learning. Patti Hilliard, a seventh-grade science teacher at Matawan/Aberdeen Middle School, also believes a video game can be made out of anything if teachers had enough time. She recently had students building right-or-wrong and matching video games to follow up on a test about genetics. So if you can build a video game, using genetics, couldn’t you have your students build a video game about anything? Chances are, teachers will hear the response that Hilliard often gets from students that come into the gaming arena. Baumert remembers one of the first applications involved eight graders building a video game to introduce incoming sixth graders to their new middle school: places and faces they needed to know; school personnel who would be helpful; etc. Think of a dynamic in which fourth graders, for example, could build a video game about the “long A” sound and teach it to first graders along the lines of reading buddies? How would that impact student engagement – for both the fourth- and first-graders? Another high-powered application could replace education’s biggest bugaboo: the end-of-the-unit test. At Milltown School, Vitali saw the power of this when second-graders completed a unit on colonial times. Gamification can also be a cool venue for students to showcase their work. Baumert’s brother is an engineer who custom builds video gaming cabinets in his spare time. There is one currently in the works for Milltown that will be placed in the cafeteria where kids can play at lunchtime. Milltown Principal Matt Lembo, who brought Black Rocket to his school after seeing it at a NJ Science Convention workshop, can envision students challenging him to play their games. Lembo was attracted by the problem-solving aspect of game-based learning, the hands-on, experiential, visual learning allowing students to come up with multiple solutions. And he also cites the sounds coming from classroom where game-based learning is happening as a way to ascertain the value of the application. But you don’t want to go over the edge, which is where this could head when trying to explain to parents that you’re asking their children to spend more time gaming. Tell them, however, that game-based learning is way to tap into the time they are already spending. Ginn references a study that indicates between third grade and the end of high school, students spend approximately 10,000 hours in class in instruction. And during the same time period, they spend approximately 10,000 hours outside of school playing video games. “If we could tap into that second 10,000 hours, we would have another whole learning track in which kids could develop and grow more skills,” Ginn reasons. 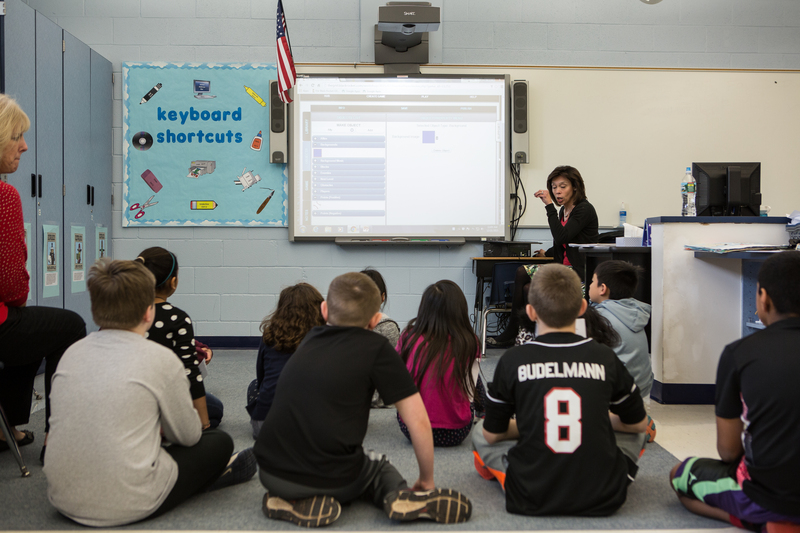 The experience writing code that Black Rocket offers and working with technology was enough for Lembo to advocate full deployment at Milltown School for this year, one year ahead of the deadline to adopt next generation science standards. The cost for Black Rocket can be less than half of what a teacher typically spends out of pocket on supplies and other materials during the school year to bring positive engagement and experiences to the classroom. And the payoff to invest can be priceless. Baumert advocates to teachers attending her presentations that game-building can become a learning skill as valuable as reading or writing. What better way to learn than to build a video game then teach it to another student? Add in confidence and perseverance gained from building the game and playing it until you can get to the top level, and, well…priceless. Teachers attending the NJEA Expo in November that stopped to check out the groundbreaking, game-changing learning opportunity on display at Write Brain World couldn’t fight back tears of oh boy. The feeling oozing from this World that somebody, finally, gets the disconnect in reading and writing curriculum had NJ Teachers overcome with you-gotta-see-this excitement and bringing colleagues back to the exhibit two, three and four times. Lynn’s latest gig provides an ELA curriculum aligned with core standards that enables students to write and publish their own hardcover children’s books. Write Brain Books comes in classroom and after-school options and is designed to promote writing, handwriting, project-based literacy, flexible thinking, perspective and get students form primary grades through high school to invest in a process they usually find to be a chore. The inspiration for Write Brain came to Lynn when she was trying to read a story to her 10-month-old niece, Lila. The book Lila wanted had illustrations but no words, so Auntie Meredith quickly created a colorful story inspired by the images on the page, kind of like voicing over a character in “Kung Fu Panda,” which Lynn did for a 2008 short. Seeing the wordless pages with lines to craft a unique story set Scott on the mission to create a book-writing adventure that has become an education innovation. A little studying on the subject led to the conclusion that wordless books had not been available for kids in more than 50 years. So she took her brainstorm to the Academy of Art University in San Francisco where ha friend’s father was the dean of the Illustration School. Wielding a sample book she put together at Kinko’s, Scott made her presentation, and a month later she had 22 illustrators submitting books that met her requisite of facilitating 10 story points. Here was confirmation that so many students have a story to tell. Inherent in the Write Brain philosophy is balancing the “technivities” overwhelming kids with an opportunity for self-expression that build self-esteem. How much curriculum out there motivates more than one way of thinking? And how much need is there for curriculum that allows and empowers kids to think for themselves? Think of the value of curriculum that enjoins students to work together to create voices for five different characters in story? Think of how this could change the conversation from one where self-worth is not just measured by test scores? Write Brain can be purchased for elementary through high school students who can publish in softcover or hardcover programs. Each program includes lesson plans, worksheets and teacher resources for a classroom unit of study on creative writing. Schools in 35 states have purchased Write Brain for more than 30,000 students since it was launched in 2014, and it has proven to be a great resource for English language learners and home-schoolers. The lessons can be tailored over a number of days or weeks, and it supports teachers to work through the entire writing cycle: collaborating, drafting, revising, editing, and “publishing.” The lessons are designed to be used sequentially, but each part can easily be adapted, shortened or lengthened. In the end, through Write Brain’s Book Builder, students have a published book with their own title, dedication and story they type in. And they have practiced creative writing, handwriting, vocabulary, reading comprehension, use of descriptive language, outlining, sequencing and plotting a storyline, sentence structure, grammar and punctuation and proofreading and editing, just to name a few skills. Scott also points out how the program facilitates the benefits of handwriting and keyboarding and meets the needs of every type of learner. Books can be published in bulk so parents, grandparents and other family members can purchase them. Some schools have even purchased copies to give to a children’s ward a t a hospital where they have gone to read their stories to patients. Theoretically, a student could have a library of at least 12 books they have authored by the time they graduate high school. One of Write Brain’s great residual values is its ability to provide an indicator of success that can’t be measured on a standardized test. In essence Write Brain unlocks the passion and imagination of the right brain balancing against the left brain traits of analytics and facts that make testing so prevalent. Since its debut a year ago, Lexia Learning’s Reading Core5 program has helped thousands of students nationwide tackle Core Content and PAARC with greater confidence. This year, it assumes a more cosmopolitan air thanks to a focus on English Language Learners (ELL) with the addition of tongues from all corners of the globe. Native Vietnamese, Arabic, Mandarin, Haitian Creole and Portuguese speakers can now join others in building English proficiencies through expanded picture glossaries, activity guides and thematic flash cards, all artfully woven into Core5’s multilayered educational strategy. A blended-learning approach, which melds the best of classroom and online tutelage, increases student engagement, oral language development and reading comprehension. It’s like a passport to the faraway. Core5 addresses development of oral language, reading, spelling and writing skills in leaners of all abilities, including ELL students, permitting them to develop foundational reading skills with the rest of their native English-speaking classmates. The program provides a high level of self- and teacher-directed personalized learning. Blended learning also helps educators bring relevant online lessons into the classroom while seeing results in real time. It lets students track progress toward their personal goals and, once having mastered a specific lesson, move onto the next at his/her own pace. “The online component is available immediately through the dashboard,” Brooke stated. Core5 helps ELL students with beginner-level language and reading skills learn key comprehension strategies for listening, reading and phonics. Students with proficient language, but weak reading skills, can develop sophisticated vocabulary while learning to identify and use idioms, similes and metaphors. Core5 offers these students personalized reading instruction and access to greater fluency, allowing them to trace their journeys around the world, view completed lessons and catch a glimpse of what lies ahead. The approach seems to be working. Early data indicates ELL students are making the greatest gains with Core5. Among results from the 2014-2015 school year, 76 percent of high-risk students demonstrated mastery in two or more grade levels in Core5 and 34 percent of on-level students completed two or more grade levels of reading skills, ending the school year having completed the next grade-level benchmark. Core5 further caters to teachers by making what they need to find intuitive and easily accessible. To learn more about how Core5 can help ELL students and the teachers who educate them, visit www.lexialearning.com. What began as a recording service for blind soldiers returning from war and blossomed into the world’s largest library of human-narrated audiobooks is increasingly speaking to a new audience – students. “Youth services is Learning Ally’s new frontier,” announced Doug Sprei, National Director of Public Relations and Communications for the Princeton-based non-profit founded in 1948 as Recording for the Blind. The organization now serves adults and students with all reading disabilities including dyslexia, blindness and other visual impairments. Through innovative programs for educators, students and parents, Learning Ally helps youngsters read at grade-level, even if they’ve previously lagged behind. 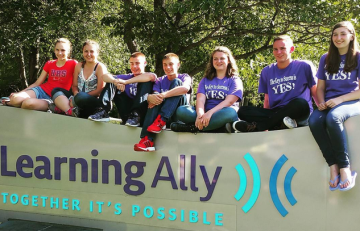 Montgomery Township employs Learning Ally in its schools. Online audio materials – 80,000 titles at last count – are opening new vistas to students previously unable to explore through traditional means. “Children who were never able to read before are now discovering new ways to learn,” another educator commented in the film. Students log into individual accounts on their personal electronic devices to add to their bookshelves and access audiobooks – the best learning approach for dyslexic and other print-disabled students. They can do this anytime, anywhere – on the bus, during lunch or reading time in class, after school, after dinner, or waiting in line somewhere. An initiative called YES!, or Youth Examples of Self-Advocacy, which began in Colorado more than five years ago, is gaining steam in New Jersey and putting another positive twist on learning. It partners children with older student mentors, also with learning challenges, who are trained to guide their younger charges through individualized goals. The approach encourages more than just reading literacy; it fosters greater confidence, independence and freedom in both mentor and child, encouraging all involved to embrace new ways of learning about themselves and the world around them. Sprei has seen students embrace their learning differences and bring a unique passion and perspective to communicating what it’s like to live with them. “I saw one ambassador in a roomful of superintendents. She had them in the palm of her hand as she conveyed what it’s really like to have dyslexia,” he remarked. YES! is offered in-person and mentors, called Youth Ambassadors, are charged with monitoring their charges’ progress, acting as resources and providing guidance as students on both sides of the equation build self-esteem, expand communication skills, learn about dyslexia, network and build friendships. Like proponents of the Decoding Dyslexia movement, Sprei questions dyslexia’s classification as a disability or deficit, instead defining it as alternate twist on absorbing information. “We’re trying to make the point that it’s just a learning difference – part of the diversity of the human species,” he noted. Learning Ally and YES! do just that by identifying and reaching students in the unique ways they learn. This support also reduces the time it takes students to complete schoolwork. “It can take some of these students two-to-three-times as long to do homework, so this program decreases that stress,” he added. YES! and Learning Ally’s other strategies are helping students find confidence and recognize inherent strengths so they can learn and thrive. The organization’s leadership concluded too many children with dyslexia and other disabilities remained unidentified or were ineffectively served, leaving them to struggle in school and emerge ill-prepared for higher education and adulthood in general. In shifting its mission from blindness-specific initiatives, it set about creating opportunities for student success by partnering with parents and educators to raise awareness and understanding of reading disabilities. One such example is 14-year-old Brenna, a New Jersey YES! ambassador. The need for that kind of nurturing support is enormous given the number of Americans who struggle with reading. Research from the National Institutes of Health and Yale University suggests one in five Americans struggles with reading despite having average to superior intelligence. This means, Learning Ally suggests, that in every U.S. classroom, there are two-to-four children who need help with reading, writing and/or spelling. Many have dyslexia or another language-based learning difference. No matter the educational challenge, Learning Ally stays trained on the positive in fostering personal achievement. To learn more about services and programs that focus on helping students read at grade level, visit learningally.org. Raise breast cancer awareness by participating in 5Ks and other pink-themed events throughout New Jersey during the month of October. Change your waking and sleeping times. Move your bedtime up, set your alarm clock and try to go to bed and wake up at the same time every day (even on weekends). Rewarding yourself for a desirable behavior is one of the most time-tested ways of changing behavior; make your mornings a “win” with a fun activity or leisurely breakfast. Then you’ll want to get out of bed. Establish a soothing bedtime routine. Instead of trying to put together your lesson plans or solve family dilemmas right before bedtime, turn to soothing activities like taking a warm bath, meditating or reading. And keep work, computers, television and other distractions out of the bedroom because they signal the brain that it’s time to awaken, not sleep. Get organized. The more methodical you are about scheduling, the less time you’ll waste – particularly when it comes to planning your day. Use a day planner or calendar to keep school activities organized and top of mind. Watch what and when you eat. It’s best not to eat anything two to three hours before your regular bedtime. The same rule applies to liquids; you don’t want to disrupt your slumber for a simple bathroom trip. Get moving. People who are more physically active get better sleep. Plus, when you’re tired, a brisk walk can help you feel more energized. Just don’t work out right before bed. Exercise causes your body temperature to rise and it takes about six hours for it to drop again. • Look beyond hotels: Especially if your group is too big for a hotel room, you can find better rates by renting a house, condominium or apartment, or by exploring home swapping. 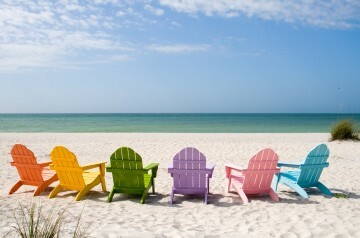 • Research package deals: Airlines and hotels are willing to offer incredibly low prices to fill their rooms and seats. But because they’re reluctant to publicize these low rates, they sell some rooms and seats to companies that put them together as package deals. • Get a free rental car upgrade: Book the cheapest rental car you can live with and arrive early in the day, before most customers have returned their cars. The agency may not have any cheap cars to give you, and they are obligated to give you a bigger model at no extra charge. • Know when to buy airfare: Research has shown that the best time to buy airline tickets is Tuesdays at 3 p.m. Mid-week (Tuesday, Wednesday, Thursday) purchases will nab you better rates because airlines release their promotional fares on Sundays and Mondays and often raise prices at the end of the week. 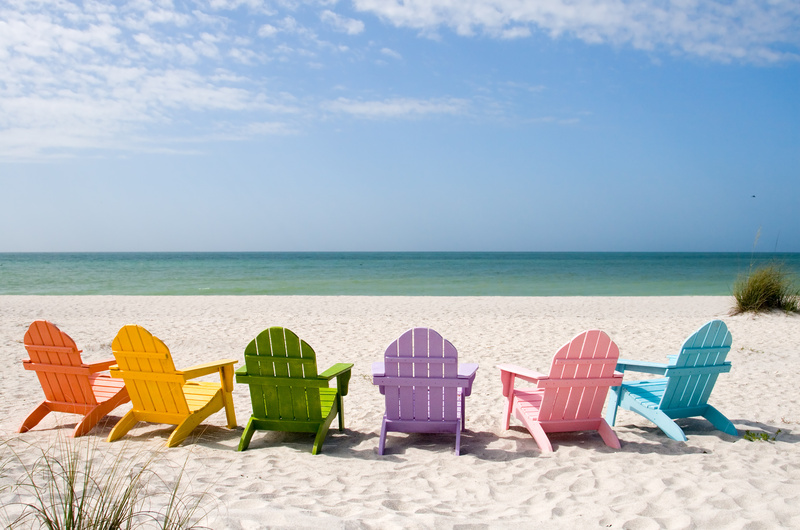 And booking about eight weeks in advance can be the sweet spot for keeping costs low. • Book cruises through a travel agent: Find one who has a close relationship with a cruise line to help you get upgrades and extras. If you like a particular cruise line, joining its loyalty program can nab you invites to members-only events and coupons worth up to $500. On a less-loyal note, however, you’ll usually save on airfare if you book flights independently, not through the cruise line. Having finished greeting hundreds of students as they step off the bus this morning, school nurse Nancy Hatke walks into her office at Kiel Elementary School in Kinnelon to find an emergency roomful of need for her attention. Kyle, a second grader who is diabetic, needs to check his blood sugar this morning. Two more kids come in complaining about stomach aches, and they have to answer Hatke’s magic question: “Did you eat breakfast?” They will get some water and a nutrition bar and be ready to head back to class in a few minutes. By 9:15 a.m., two more cases of stomach aches will arise, as well as two more with headaches. By 9:30 a.m. Hatke will have seen 11 students and by day’s end, she will treat more than 100 cases. Some will be kids with mystery coughs trying to get away from math tests. Some will need medicine administered. There might be Asthma attacks, allergic reactions to lunch and maybe even one or two who have lost a tooth during the day. Some need just to “talk.” Some students come in for vision or hearing screenings but, hopefully, nobody will be coming in after recess with a broken bone. And a teacher might need a lesson in using an EpiPen. Nobody leaves without getting proper attention and then some. An emergency room should experience such success and efficiency as what has taken place in Nancy Hatke’s room. Hatke is not only a Certified School Nurse, who not surprisingly started her career as an ER nurse Overlook Hospital; she is a Certified Emergency Medical Technician. She has Master’s in Education. And because she showed us how the school nurse just might be the one person in the school who makes an impact from the classroom to the staff room to the lunchroom, and beyond, Nancy Hatke is the January 2014 Think Teachers Magazine Teacher of the Month. For several months, we have been looking for a school nurse to spotlight, believing the nurse plays an integral role in the education environment at any school. We had no idea, however, of the breadth of her contributions. Hatke has put together a chart that hangs in her office for non-verbal students in special education classes to communicate how they are feeling. She reviews the school lunch menu to ensure no foods are being served that risk allergy exposure. And she is one of a few people at Kiel who knows each and every student by name. So the refrain comes from Hatke, making sure to dispel the stereotype of the school nurse. Actually, less than 10 percent of her calls are for band-aids, and on the particular morning when she treated 11 people during the first 30 minutes of school, only one required a band-aid. And that was for a teacher. Hatke’s vast knowledge base prompted Ciresi to add her to the school’s Emergency Response Team. She put her creative thinking into writing a grant that earned Kiel a new Automated External Defibrillator (AED), and she recently completed a project with a nurse at another Kinnelon school to check if the district’s medical policies were in line with state law and compare them to best practices in other districts. The reports was submitted to the superintendent and brought the district schools some tools they needed to maintain proper health support. The warmth Hatke brings to Kiel seems to make her integral to the school’s learning environment. Students might come to her office wearing that face that cries, “My tummy hurts and want to go home to my mommy.” All teachers know that face. Hatke responds with a treatment suggestion, a little time to let it get better and, well, love, which is the fuel to her power of healing. Students trust this response. They trust her, and most go back to class feeling better. She runs through the menu of day-to-day reasons students come to the nurse, and it’s just what we expect: Cuts, scrapes, bruises and other playground injuries; stomach aches due to missing mom, dad or the dog or not liking the substitute teacher; and the mystery cough. But there’s a lot Asthma and severe allergy issues to deal with and administering all types of medication to more and more kids who seem to get it prescribed these days. Clearly, it’s not just band-aids. Get the feeling that Hatke can be rather direct about the importance of the school to education? Early in her school nursing career that is now at 20 years, Hatke was sitting in the staff room during lunch time when a colleague happened to blurt out that, “I was not a teacher. I was only a nurse,” she recalled. After getting her Bachelor of Science in Nursing with a minor in Bio-Chemistry from Trenton State College (now The College of New Jersey), she started as an ER nurse before moving into public health and working for the Visiting Nurses Association of Morris County and later the Rockaway Township Health Department. During that time, she conducted state-mandated health screenings and found that students were her calling. So in 1993, she earned her School Nurse Certification from Caldwell College and in 2004 she became a teacher by completing her Master’s in Education at Seton Hall. Few teachers would challenge that there are some contributions to the school only the nurse can make. Hatke takes that to the 10th power. Perhaps it’s the residual of her days in the ER where nurses are required to move…stat. So she constantly looks for ways to impact students. This past year that led to dealing with the growing childhood obesity problem by advocating for “no food birthday celebrations.” Students no longer bring in cupcakes or other snacks on their birthdays. That’s eliminating 20 snacks times 20 birthdays in a class during a given year: do the math about the amount of calories cut. Instead, once a month students who have a birthday that month eat lunch with the principal and pick out a book to donate to their classroom library. Clearly, Nancy Hatke is the type of professional a school wants in the nurse’s office, the kind a successful education environment needs in the nurse’s office. Compassion, no doubt, drives her approach. “I love that I can have a student come to me crying, and 10 minutes later have her skipping back to class,” she notes. And protection, no doubt, is the outcome of her approach.